If you saw the recent ad sponsored by the Republican Party in North Carolina that featured Senator Barack Obama side by side with his “spiritual mentor of 20 years,” the Reverend Jeremiah Wright, you know what is in stock for Senator Obama in this fall’s general election campaign, if he becomes the Democratic Party’s nominee. While the North Carolina ad and similar ones elsewhere are part of congressional contests, the Wright-Obama association will become the predominant theme of this fall’s “Swift Boat” version. Under-the-belt campaign ads like the Willy Horton commercial and similar attack ads that derailed Governor Mike Dukakis presidential chances and the “Swift Boat” offensive against Senator John Kerry are typically financed and placed by groups that do not have official ties to the benefiting campaign. Like George H. W. Bush in 1988 and George W. Bush in 2004, John McCain will be able to distance himself from Obama-Wright ads, point to unaffiliated groups, and even disavow this tactic. But the damage will be done because negative campaign ads work—regardless of their sponsors. Chances are that Obama will be bombarded and maybe defeated by attack ads just like Dukakis and Kerry in earlier presidential races. Clinton’s clear victory in Pennsylvania, media columnists and analysts, obviously no friends of Hillary, wasted no time to advise the junior Senator from New York that this was the time to drop out with honor. What a nonsense! Why would any candidate for the presidential nomination of one of the major political parties throw the towel before the finish line is crossed by the victorious competitor? The same voices in the mainstream media and in the blogosphere that contributed mightily to and exploited the nasty tone of the Clinton-Obama race, are now eager to proclaim the winner before the competition is over. Allegedly, to preserve the Democrats’ golden opportunity to win the November election. What is wrong with keeping this very close race going? Why would it be damaging to let the nominating convention make the final decision, if neither candidate receives the required number of pledged delegates to clinch the nomination? The fact that most presidential nominees in the post-reform era emerged early in the primary seasons does not preclude to run the whole race. The longer this competition lasts, the more voters get a chance to participate. What could be better for democracy? I doubt that TV-audiences mistake these analysts for journalists, but I bet that they are widely perceived as more or less independent military experts. Instead, after suing the Pentagon for and gaining access to thousands of e-mails, transcripts, and other documents, the Times established the opposite: While many, not all, of these former military leaders collected between $500 and $1,000 pro appearance, they were according to Pentagon records considered “message force multipliers” and “surrogates” who propagated the positions of the Department of Defense disguised as their own opinions and judgments. Some of the analysts, who were not paid by one of the TV-networks, had other sources of income that was enhanced by their selling of Pentagon propaganda: they were lobbyists for companies competing for defense contracts. There is a standard story emerging about how we should think of the Bear Stearns takeover. Not in regard to its effect on capital markets, now or in the future, but the actual back-and-forth negotiation of whether JP Morgan was going to take over Bear Stearns, and if so at what price and under what conditions. We tell the story three different ways. First, the conventional wisdom as of now, which paints a picture of frantic negotiations to avert a looming crisis, but which, we argue, leaves some important questions unanswered. We then offer two different game-theoretic analyses of the takeover which address those questions, albeit in different ways. The end result, we believe, is an interesting example of how the tools of game theory can help analysts understand the strategic underpinnings of economic transactions. 1. According to the usual story, JP Morgan went into the weekend of bargaining thinking it could offer $10 per share of Bear Stearns. Over the weekend it started doubting that price, and it was about to walk out on the deal when the Fed, anxious to avert a total financial meltdown, negotiated a $2 per share price instead. This was sufficient to let the deal go through, but then the shareholders revolted and JP Morgan got a lot of bad press in the ensuing days. To improve its image JP Morgan upped the bid back to $10, which was then accepted to everyone’s mutual satisfaction. This story makes sense as far as it goes, but then why all the poison pills/lock-in provisions in the deal? Why were these insisted on, and why did the Fed agree to them? And in this story James Dimon, the JP Morgan CEO, is portrayed as misjudging his initial offer, complaining about not being able to send Bear Stearns into bankruptcy, and then reversing course under pressure. Did he really make such basic errors? 2. The second story is an incomplete information game theory story; unusually, it is more straightforward in this case than the complete information story to come next. According to this version, JP Morgan didn’t know how much Bear Stearns stockholders would accept, so it started low and bid up from there, as any game theory text would tell them to do. This strategy had risks for both sides; if bargaining fell apart then the firm could implode, to no one’s benefit. This means that the negative reaction to the initial bid was a truly costly signal, and JP Morgan understood it as such, hence raising the offer. This story makes Dimon look more like a shrewd negotiator than the previous one; we might even be able to excuse his complaining about not being able to send Bear Stearns into bankruptcy as a bit of theater, aimed at moving the negotiations along. But we still need an explanation for the lock-in provisions, and the Fed’s eager acceptance of them. 3. Finally, the complete information game theory story. Here we’ll more carefully define preferences and the game being played, illustrated in the figure below. Let’s assume that there are three options: continued operations by Bear Stearns (O), bankruptcy (B), and a takeover by JP Morgan (T). Bear Stearns management and the board had preferences O-T-B: they would have liked to keep operating, perhaps with an injection of liquidity from the Fed, but they preferred an orderly takeover to bankruptcy. The Fed and JP Morgan both had preferences T-O-B, preferring the takeover most of all, and again fearing the chaos of bankruptcy. Bear Stearns shareholders had preferences O-B-T; they could try to tough it out as things were, otherwise they actually preferred bankruptcy to a takeover, since in the former option they could bargain with bondholders to get a higher share price than they would from JP Morgan. The game is played as follows. First, the Fed decides whether or not to offer Bear Stearns the opportunity to borrow short-term to cover its debts. If it chooses to lend, then Bear Stearns management (BSMgmt) gets to choose whether to try and keep operating or go into bankruptcy. Once the Fed denies Bear Stearns the liquidity, then operation really isn’t a choice any more, and the only question is whether a takeover can be arranged. JP Morgan has to approve any takeover; if they reject then bankruptcy is the result. If they accept, then Bear Stearns equity holders (BSEquity) have to accept as well, or again we have bankruptcy. And here, perhaps, is the solution to the problem. Note that every player except the equity holders had bankruptcy as their least favorite option. But since the equity holders have the last play in the game, and they prefer bankruptcy to a takeover, the whole deal would be in jeopardy. That’s why the lock-in provisions were so important; they raised the costs of declining the deal so that the equity holders would actually prefer the takeover to bankruptcy. Dimon was upset because he realized those provisions were insufficient to close the deal, forcing JP Morgan to pay more to get shareholders to agree than they had planned. And the Fed favored these provisions as a necessary element of getting a deal done and avoiding Chapter 11. The insight gained from this analysis is that the weakest link in the ratification chain drives outcomes in takeover deals. Here, it was the equity holders, with the most to lose from the takeover, whose preferences shaped the final bargain. Note too the differences between outcomes here and outcomes in the usual bargaining games. When any party to a bargain can simply walk away from the table and thereby enforce the status quo, then in equilibrium all other players usually have to pay extra to accommodate the party most reluctant to make the deal. 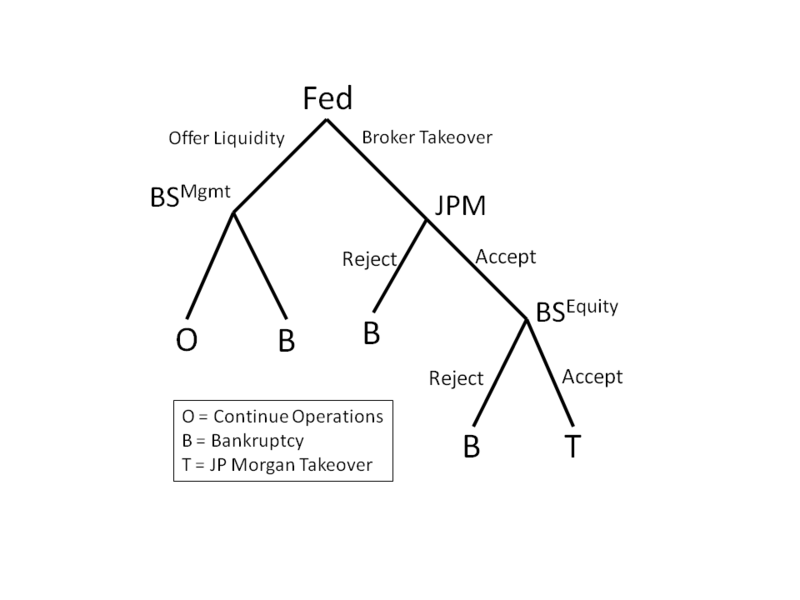 In the brokered takeover scenario depicted here, though, the Fed made the status quo untenable by refusing to lend to Bear Stearns initially, thereby weakening the equity holders’ bargaining position. So rather than make them better off, the deal was structured to make them worse off; the lock-in provisions made bankruptcy less appealing and coerced the equity holders to settle. Thus bargaining in a brokered settlement looks more like politics, with coalition formation and strategic agenda control, than the standard alternating-offer bargaining scenario of economics. Contrast this result, then with Washington Mutual’s recent rejection of JP Morgan’s takeover bid of $8 a share. Since this was not a brokered takeover, WaMu management simply walked away from the deal and instead sold the equivalent debt to a private equity fund. This maneuver was probably not in shareholders’ interest (the stock price fell the day the deal was announced), but it let the current managers keep their jobs. Here, the managers were the weakest link in the chain, and since the JP Morgan offer did not make them unequivocally better off, they preferred a white knight to selling. The great non-bailout bailout of ’08—the shotgun wedding (heard around the world) of Bear Stearns and JP Morgan—has generated widespread calls for a new, more capacious regulatory environment in which a Super Regulator (for instance, the Fed), will be delegated super powers to monitor firms’ risk profiles and demand higher reserve ratios to make it less likely that a single firm’s collapse can bring down the entire economy. The Treasury’s long-awaited “blueprint” for streamlined regulation, for instance, was finally released publicly, even though it failed to address the types of transactions that led to the Bear Stearns collapse. The idea is to bring the shadow banking system out from under its penumbra and into the light of day. While this logic has gone from radical to common wisdom in the space of a few short weeks—the Treasury had delayed releasing its blueprint for month for fear that it would destabilize financial markets—its corollary has yet to be fully understood: namely, that the Fed will need to acquire a parallel set of obligations vis-à-vis elected officials. Let me explain. The Federal Reserve actually has two functions. In the first, acting though its Open Market Committee, the Fed sets the federal funds rate and the discount rate; the combination of these instruments determines the rates at which banks lend money to consumers. Its other, lesser-known, hat is that it acts as one of the chief regulators of the banking system. For a bank to open a new branch, for instance, it needs Federal Reserve approval. International financial institutions seeking to do business in the US are also subject to Fed supervision. It is not for nothing that the entire Federal Reserve System employs over 20,000 individuals at an annual cost of over $1.2 billion. It is this second role that allows the Federal Reserve to make loans to individual banks, extend credit, and act as the lender of last resort, including its $29 billion “loan deal” to facilitate JP Morgan’s acquisition of Bear Stearns, which looks an awful lot like an equity purchase. And here is the rub. The Fed’s actions to salvage the financial system were bold, innovative and probably necessary. In its former roles as setter of monetary policy and overseer of the banking system, the Fed operated in relative autonomy. But in its new guise as Super Regulator, performing deeds of derring-do to rescue helpless (hapless) investment banks tied to the railroad tracks and about to be run over by structured investment vehicles, the Fed is itself taking on additional responsibilities without the accompanying political oversight. Standard theories delegation and discretion argue that in politically sensitive areas such as using taxpayer monies to cover billions of dollars of bad loans made by private sector financial institutions, elected official will want to have, and properly should have, a role. For instance, no one in the frenzied weekend of deal making bothered to notify congressional committees as to what was transpiring; the Fed will no doubt be feeling some of the backlash for its political misstep in Senate Banking Committee hearings later this week. This does not mean that Congress has either the desire or the capacity to micro-manage the Fed’s actions; indeed, committees will need to hire specialized staff members just to regulate the regulators. Especially in current times when banks are continually, devilishly inventive, devising new ways to move risky transactions off the balance sheet, Congress needs the expertise possessed by Fed officials to keep a handle on the system. But just as importantly, the Fed needs the cover and legitimacy that only elected officials can provide when taking actions claimed to be in the public interest. As it now stands, the Fed has the enforcement powers of the DOJ combined with a hands-off system of minimal oversight. In the long run, this is a recipe for disaster. So by all means, let us give a single regulator the authority needed to oversee and efficiently manage the safety and soundness of our financial institutions for transparency and accountability. But at the same time, the amount of discretion such a super regulator will and should have must be balanced by the public’s need for transparency and accountability in the regulator’s own actions as well. The numbers in Hillary and Bill Clinton’s tax returns for the last 8 years are breathtaking—a total of $109.2 million since 2000 and $20.4 million in income last year alone. Most of this wealth was brought in by the former president on account of his fees for speeches all around the world. His and her book advances were not shabby either. According to a list of the Bill Clinton’s speeches from 2001 through 2005, he collected between $28,100 (London School of Economics) to $400,000 (Mito City Political Research Group, Japan) per speech for a total of $31 million during that period. But Bill Clinton is not unique among former presidents. After leaving the White House, Ronald Reagan collected $2 million for two speeches in Japan. George Herbert Walker Bush, too, made more than some change on the lecture circle—although he, unlike Clinton and Reagan, was never known as a great communicator. His son, the current president, told author Robert Draper, that he too wants “to hop on the lecture circle when he leaves office” and “replenish the ol’ coffers.” He guessed that his Dad made about 50,000, 75,000 dollars a speech. To be sure, Bill Clinton does not only love to talk—he does it well, often and for eye-popping fees. Yet, I found it hilarious when NBC’s Andrea Mitchell reported this morning with great seriousness on the high income of the Clintons and the yet unknown implications for her presidential campaign. After all, Mitchell’s husband, former Federal Reserve Chairman Alan Greenspan, has used his retirement to give many speeches here and abroad for a reported $150,000 per speech. Since neither Greenspan nor Mitchell run for public office, they do not have to reveal their tax returns. But it is entirely possible that the former Fed chair earns as much for his speeches as Bill Clinton—or comes at least close to the former president. The $8 million advance for his book authored after his departure from the Fed is major league as well. The Clintons are not an exception. Ex-presidents as others who leave high offices use their name recognition or notoriety or both to make money—big style. And sitting and former first ladies and first sons and daughters collect hefty sums as well as authors or in other endeavors. Whether we like it or not, that’s the reality. Israeli-Palestinian Peace: An Impossible Dream? The fact is that President Clinton’s proposals did not move the parties closer to peace at a time, when the Palestinian Authority was far stronger and Hamas far weaker than today. Then, there were two parties involved in the peace process. Today, President Mahmoud Abbas speaks only for part of the Palestinians and the Hamas leadership for a growing number of the people in Gaza and the West Bank. In part, this shift was a result of Hamas’s strong showing in elections that the Bush administration pushed for.